This post brought to you by Deep Capture Blog. All opinions are 100% mine. 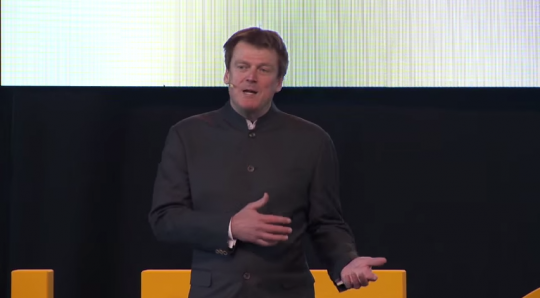 Patrick Byrne, an ardent supporter of Cryptocurrencies like Bitcoin, recently delivered the 2014 Bitcoin conference keynote address in Amsterdam, Netherlands. Overstock.com CEO Patrick Byrne has a doctorate in philosophy and studied computational theory at Stanford. Because of his background and ideals, Patrick was immediately interested in Bitcoin when he was first introduced to it. This eventually led to Overstock.com trailblazing the way into becoming the largest online retailer in the world that accepts Bitcoin payments. Patrick's keynote presentation whisked attendees away on a historical tour of individual liberty, tracing the roots of the American philosophies of freedom. Mr Byrne then detailed his thoughts on the primary institutions that Bitcoin is best positioned to disrupt; Central Banking and Central Counterparty Clearing. Central Banking is a concept that institutes a central financial authority within a country or group of countries, which acts as an authoritative monetary controlling institution (such as the Federal Reserve), manipulating the economy. This authority implements policies that are detrimental to the general population, such as the "lender of last resort", which allows bad banking institutions to get bailed out by citizens and tax payers. The CEO's and the shareholders of these bad companies do not suffer for bad decisions. Instead, their risks are hedged by the general population of tax payers, who foot the bill to prevent them from failing. This eliminates a key feature of a free market economy where bad banks, bad companies and bad financial institutions would be forced to pay for engaging in risky business activities that result in massive losses, or other such mistakes. Massive losses should cause a bad institution to go out of business, get cleared away, and get replaced by better players. In the USA, the "Fed" also continually creates new money out of thin air, exponentially increasing the US dollar money supply year after year. This continuous expansion of the fiat money supply causes the value of the dollar to continually erode. With the value of the dollar falling year after year, consumers bare the brunt of constant inflation, seen as the cost of goods and services rising more and more. Central Counterparty Clearing is the large, messy system used by the financial institutions to maintain and record who owns what. The current system is highly flawed, leading to extremely slow transaction clearing times, inaccuracies and other problems. Bitcoin and cryptocurrency technology can sidestep the Central Banking and Central Counterparty Clearing systems, providing solutions to many of the problems, risks and inefficiencies that consumers previously had no choice but to utilize, prior to Bitcoin's availability. I have embedded the 2014 Bitcoin conference keynote below and I encourage you to watch the video and share your thoughts on it by commenting below. Patrick Byrne's speech starts at about the 16:00 mark. Follow Patrick Byrne on Twitter.